Disaster Protocol: Is Your Company Prepared for the Worst? This month’s National Association of REALTORS® (NAR) Power Broker Roundtable discusses broker disaster/emergency policies and procedures. Rick Haase, President, Latter & Blum, Inc., REALTORS®, New Orleans, La. Marnie Goldschlag, Co-Owner, NextHome Wine Country Premier, Santa Rosa, Calif.
Rei Mesa, CEO, Berkshire Hathaway HomeServices Florida Realty, Miami, Fla.
Michael Saunders, CEO, Michael Saunders & Co. Realtors, Sarasota, Fla.
Christina Pappas: Around the world, 2017 was an extraordinary year in terms of natural disasters. Fires, floods, hurricanes and earthquakes inundated numerous areas, threatening lives and testing resources even in regions not typically thought of as being particularly at risk. There is almost no way to adequately measure the cost in terms of lives and property—or, for that matter, the bravery and resolve it is still taking as we work to repair the damage. But one thing is clear: Whether we are testing disaster protocols long in place, or newly struggling to create procedures to help bring order out of chaos, tragedies like these present an alarming call to action. 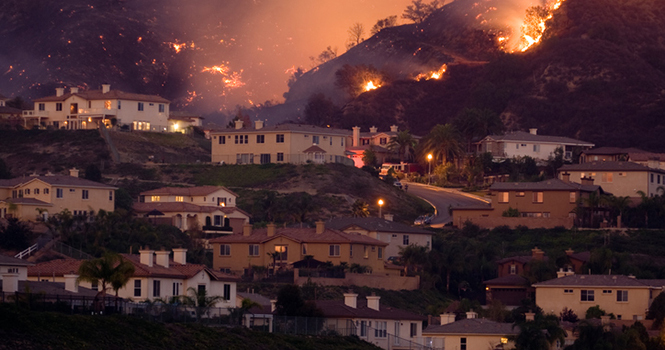 How prepared are you and your company to effectively face catastrophe? Rick, in your markets, Hurricane Harvey was only the most recent disaster. What protocols have you had in place, and what advice would you offer? Rick Haase: First, let me say that even if you have procedures in place, it isn’t until you experience substantial threat that you find out how protected you really are. In our case, the Katrina disaster became a mental model for me. Once we dug our way out of that, we seriously scrutinized every area of our business, and we came up with questions we needed to answer: Do we have a central number in place where agents and employees—some of whom suffered personal loss—can get emergency information? Can we get into our accounting system so that payroll is not disrupted when our people need it most? Today, our operations are totally portable and accessible. Even if an office or two are nine feet underwater, we can operate from a remote area, get those paychecks out, and keep backup procedures running. Marnie Goldschlag: Having recently been through the devastating—and totally unanticipated—fires in Santa Rosa, I can certainly relate to that…and we quickly realized the need for outreach extends to our client base, as well. My partners and I called every agent first to determine how they were and what they needed, and then had them call everyone on their client lists. As it turned out, my business partner and I alone had 12 of our clients who lost their homes, and our office agents have similar stories. Our agents were out there with them, helping to deal with insurance agents and sift through the ashes for any salvageable possessions. This was a test of community, which is what our business is built on, as well as a chance to put procedures in place for a natural disaster or emergency, which had not occurred to us before. Rei Mesa: Being in Florida, which has a definitive hurricane season, we have some of the strongest building codes in the nation—but we also have some of the most extensive disaster protocols, which we review and update every year. Of course with hurricanes, we generally have some advance notice, which helps. In many cases, we have time, for example, to remove all our yard signs so they’re not being hurled around doing more damage in hundred-mile-an-hour winds. But when it’s all over, we know recovery is primary, and we have protocols in place to manage that. As soon as the all-clears are issued, we’re reaching out to agents, clients, and the REALTOR® community to help ensure that business can get up and running with as few impediments as possible. Michael Saunders: The keys, I think, are communication and education. We keep extensive manuals in every office, and we are developing preparation guides and emergency checklists for the 20,000 names or so that are in our database. We keep a hurricane box in every office—radios with extra batteries, water, flashlights, and so on. Agents get out and put up storm windows on homes they know are vacant—and we close our offices in plenty of time for our people to get home and prepare. And we also pay all our people in advance, so they can pay their bills and manage their lives even if they need to evacuate. CP: So contingency plans are the first step no matter where you live and work, followed closely by keeping the lines of communication open and having recovery plans in place. MG: Even when you know it’s coming, you can’t be totally prepared. So everyone everywhere—families, businesses—we all need to have protocols in place. RM: And everyone needs to know in advance who’s in charge, how things will get done, where and how to stay in touch. MS: We’re now in the process of installing a satellite, so we can bypass traditional power sources. RH: Insurance, communication, viable systems and equipment—it’s all critical in a crisis. But in Chinese, the symbol for “crisis” is made up of two characters: one translates as “danger;” the other translates as “opportunity.” Don’t wait for danger to occur. Take the opportunity now to plan, organize and implement.